It was a busy day with Grandma and Grandpa including an 8:25 am soccer game (sounded terrible until we saw a friend who had played “the early game” before us!) which included a goal and an assist for M, rehearsals for Cute W and M for their show at church tomorrow, a cooking project, the movie Big Miracle (wholesome and enjoyable, but a little sadder than expected because I didn’t remember the story at all), some shopping, and dinner out. Between shopping and dinner, J started to lose it. It would be understandable if she were just plain tired, but she had chills and a headache, so I fear that she’s getting sick. We’ve been driving around in two cars to fit everyone (not environmentally friendly, I know, but when relatives aren’t visiting we’re guzzling less gas than those minivans which I’m too scared to drive anyway). So I aborted the mission and J and I ditched the restaurant and came back home to cuddle in bed. Now I’m wondering if tomorrow morning we’ll a) have a nice healthy J, b) have a sick J and I’ll miss the show entirely, c) have a sick J and I’ll pull a babysitter out of the ether, or d) have a sick J and I’ll leave her alone just long enough to drive over and watch the one song that M’s singing with the junior choir). Clearly, I’d prefer option a. Sigh. At least Cute W has a video camera. Anyway, the cooking project was actually an attempt to figure out our edible craft project for M’s Valentine’s Day school party. M’s 4th-grade teacher wanted to try these cute cupids from Family Fun. I said “Sure!” when what I was really thinking was that they were slightly too ambitious (the two different colors of decorator’s gel shared by 21 children, the piped frosting, etc.) and also that I didn’t like how Aryan the cupid looked in our multi-ethnic class. So I pondered how to address these concerns. Because I am freakish that way. Perhaps I should have said no. But that’s not sporting. 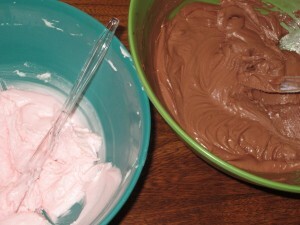 First, I made frosting in two colors–vanilla frosting with a bit of food coloring to make it pink and brown chocolate frosting. I figured that kids could choose and/or mix. I also got Cocoa Krispies in addition to the Rice Krispies for hair options. 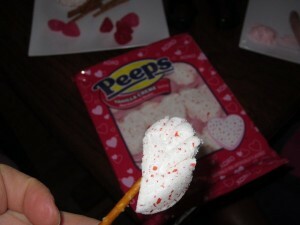 One pleasing innovation was these heart-shaped Peeps for the wings. Half a heart is even better as a wing shape than a marshmallow. This was Cute W’s idea. He’s so clever. I think that I’m going to cut them ahead of time, because otherwise I’d have to provide multiple pairs of clean scissors for 21 4th-graders. Again: ambitious. I also decided to blow off the decorator gel. We decided that Twizzlers would work for the mouth, and we experimented with chocolate chips, M & Ms, and TicTacs for the eyes. Oh, and I got gummy hearts instead of foil-wrapped, because I couldn’t find foil that was plain red without a words to advertise something, and besides, who wants wrapped candy on their cupcakes? We’re blowing off the piped-on hand entirely. Just not happening. 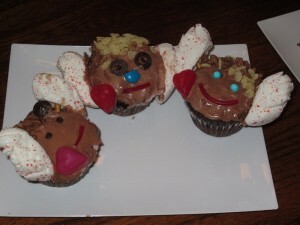 The girls and I each made one cupid cupcake to test the difficulty and ponder our eyeball options. Our results: a preference for chocolate is apparent, but we actually each mixed both vanilla and chocolate. We went with different eye techniques, none of which were entirely successful. All in all, these cupcakes make me laugh. It’s a bit like when they show you the advertisements for a Big Mac and then the actual Big Mac. 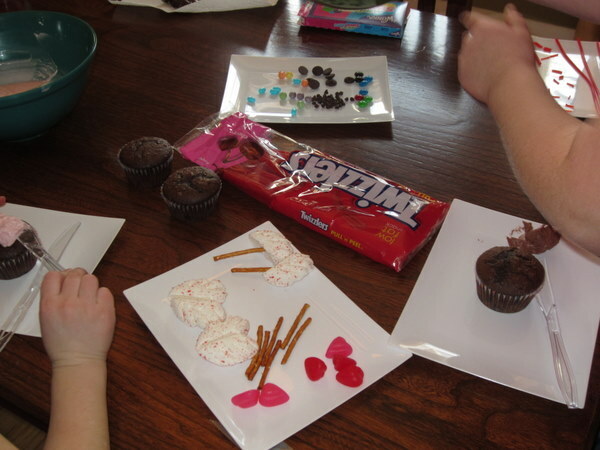 Except in this case it’s the adorable cupcakes prepared by the food stylists at Family Fun vs. cupcakes prepared by actual children of mothers who are not willing to buy little tubes of icing. It’s a clever idea. The wings worked much better than I’d expected. And of course, a parent could make a full batch of those adorable cupids at home with some decorator gel and piped icing and then show up at the school party pretty much feeling like The Most Awesome Parent Ever. But we’re all about class participation. We’re all about process, not product. Which is pretty clear from the picture. Oh, also? They’re tasty.